.. a torrid love affair. Miin is reunited with the Blood Falls. When we last left our decrepit conjurer, she had been no further north than the Portal. However, many months had passed and the slow, steady pace of her hooves finally brings her north of the Pinnacle. The travel pace was slow and the path erratic, leading to her spending many weeks to travel the distance any normal inhabitant might cross in a few days. For now, the witch remains largely cloaked in the shade of the evergreens, her coat a sickly pale white and limbs thin - so little stretched across far too large a body. Her dark eyes shine in the darkness with manic glee, however, when they fall upon the crashing, crimson waters. This is a sight Miin has not been able to see in several years. "Ah, crimson waters return," she says with excitement causing her teeth to chatter more than the winter chill. "Vourib must be back too. Good, good." Her eyes dart about the small clearance of bank without trees before she darts outward, her body moving impossibly fast for one so old. For the first time in our journey, Miin appears spirited. The mare hops and skips along the ice coated shores, cackling with a sickening glee from all her maws at differing times and tones. The cacophony of laughter echoes off the trees and peaks, the volume unmonitored. After all, not much approached Miin. She was frail in appearance, but certainly not one that most would willingly draw near to. As her figure bursts from the shade of the trees, we discover a secret not yet known by our readers. Her body begins to shine and glimmer in a myriad of neon colors, almost as if she were made from broken glass of various objects. The colors distract from the odd proportions of her body and only mildly from the mess of noise spewing from her. Of course, being Freeze, it is too cold for her to wade into the waters. After sufficient, child-like excitement, Miin stops by the shore and coos at the river of blood. "Ah, Miin is so happy you are back, precious," she says with delight from one maw. "Did those nasty thieves taint you, precious?" another asks. and tear away at the restraints they call the body. for the body is but a piece of art for you to tear to pieces. Korri's head was full as he flew southward. He had walked a considerable distance on his own. Watching the sky dance above him as he traversed tundra, watching the mountains rise in his vision, watching the wind sweep snow back and forth. But eventually, he had launched himself skyward to the part of the world where he was most comfortable. He was nimble in the air, swift and untouchable, a fleeting golden light racing just ahead of morning. He might have been happy if not for the absence of his raven still gnawing at his chest every time he breathed in. Every time he glanced back hoping to see her and seeing only empty sky. Korri became dimly aware of the noise as he flew. It was a distant roar at first, like a beast in pain. But it kept up. Unceasing. And in the back of his mind, he knew what it was. That particular sound had embedded itself permanently in his brain, so he recognized the rush of water even from a distance. Even without thinking. Korri turned his gaze downward as he flew, until he was on top of the noise and on top of the water and he saw it was a waterfall, red and toxic in appearance. Angry. He slowed his flight as he passed it, and banked around until he was circling lower and lower. His ears pricking as finally the sound of a voice reached him above the water. As he spied something — something — gamboling about the banks of the river below. A shudder went through him. A cold feeling Korri recognized as fear but which gripped him so rarely, and never so completely, that he almost didn't recognize it. That he almost turned and flew away, because whatever was running around down there was dangerous (he knew this he knew this in the very depths of his brain where instinct spoke without hesitation). But then he realized he was afraid, and the realization annoyed him, and he banked around and landed near the top of the falls, instead. Too near the roar of water but far enough from the... thing below. His neck craned down, Korri blinked at it. At the strange edge it walked between beautiful and terrible. Like an apparition. Like a ghost, or a god, except too small and not quite terrible enough to be a god. He watched it for some time, wondering. His wings folded slowly at his sides and then he called out, in a perfectly cheerful voice, as if the thing looked normal and he was not at all afraid and he had really only just spied her from his vantage point. "Hello!" Here, a brief pause. Here, a subtle tensing of the muscle of his shoulders. As if he expected the thing to somehow make it up to him in a matter of seconds. As if he expected the need to escape. But he continued talking as if he were not afraid, his eyes riveted on the unnatural shape. Korri found that now he'd seen it he couldn't take his eyes away. "Do you live here?" Fast, like a cat swiping its paw after a buzzing fly, Miin's head turns in the direction of the new arrival. All four of her eyes narrow into threatening daggers as she look through the pink mist of the falls toward the source of the noise. A boy, perhaps, though supple like a female, causing the demented maiden's mind to swirl. His body is covered in a thick pelt, much thicker than her own, and he is short. Definitely shorter than her. Probably shorter than most, almost like a child. Contempt in her eyes fades into something less menacing, though just as disturbing. A sick interest is taken in this new... puzzle. Miin's maws open into a smile, misplaced next to the still oddly violent expression on her face. Miin seemingly ignores the question. "Hello, fluffy," she renames the boy suddenly, caring not what his true name was. She steps closer toward the ledge upon which he stands above her, squinting to try to make out more details about the creature against the pallid light of the winter sun. "What brings you to see the precious, hmmm? Did you miss her too?" Then, as if distracted, the witch turns her head back toward the crimson waters. The fuzzy thing on the ledge could wait. She wanted to see her beloved bloody waters. For a moment, she is perfectly still and calm. The sound of crashing waves soothes her enough to remain still and quiet, but it is short-lived. Remembering the second question asked, her eyes lazily roll over to the boy high above. She attempts to keep at least one eye watching the churning, violent waters a few feet away. "Miin lives here, fluffy one, yes she does," the old hag croons to him sweetly from one of her maws. Then, quickly, another barks in a sharper tone of voice. "Though, she hasn't lived within the crimson waters for years, not since those filthy, no-good sunstealers took them." A hissing noise escapes the third, and her face turns black with malice for just a moment. Then, she turns her face completely up toward the pegasus. Her eyes are empty voids, and the smiles plastered on her lips look anything but happy. "You're not one of the nasty thieves, are you fluffy?" A predatory snap to the turn of her head. Korri tensed, prepared to take wing once more despite the distance between them, but it was just that: a turn of the head. Across the distance, the two of them appraised each other. She was wrong no matter how much he looked, her face like a kaleidoscope, her limbs matchsticks beneath her, the light refracting off her coat. A nightmare, Korri thought. Was this something the Rift had made? Or had it... done something to her? He couldn't stop looking, even though a healthy portion of his mind screamed run away! "Hello, fluffy." Well, Korri had been given worse nicknames. He supposed this one was appropriate, but he didn't like the way she looked at him. It reminded him of a leopard seal, or maybe an orca. Hers was a killing smile. Korri leaned his head back down again, though, hoping she couldn't make it up to him. He wasn't sure how he ought to answer her question. Did she mean the falls? The water itself? Was there something to it? He glanced askance at the ruby waters, and a horrible thought struck him: did drinking it make her what she was? Just in case, he edged aside a single step. Apparently unperturbed by his silence, the creature was speaking again, and he pricked his ears to listen. "Oh!" he heard himself say, though perhaps she missed his voice against the roar of the falls. "Sun stealers?" Korri took a step forward, craning his neck down further. He stood precariously near the edge, but he wanted to hear everything she had to say. "Are you saying they stole this waterfall? How... did they do that?" Korri's wings flexed as he leaned farther forward. "Were they...." Here he paused, searching for a word. Unable to find it, he compromised. "Did they look like me?" If the elder mare notices his fear, she gives away no hint toward such. After all, Miin has become used to the look of horror and sick fascination in the eyes of others. Many, many years ago she may have been quite the beauty, but with each unfortunate death, her figure twisted and stretched more and more. Her faces split and grew. Horns sprouted from her crown. The color of her coat began to change in the light of the sun. The corrupt air of the Rift transformed her into this creature, so slowly the mare never noticed its effects, for countless deaths had worn down more than just her youthful frame. Sun stealers? he asks, though her ranting continues for a bit. He takes a cautious step forward, and Miin makes no such attempt to close their gap. She picks up on his questions, though perhaps not consciously at first. Her mind boils in vengeance and hatred, thinking back to the day that nasty filth came into the Rift and started taking what they liked back to their home. Miin cared little for Kisamoa, but she had to admit he did well destroying those tricksy buggers and the land from which they came. Her smile grows darker as she thinks to answer his questions. "Yes, fluffy," she starts, her maws chattering with displeasure and chill. "They took the crimson waters, the colorful salt pools, the emerald mazes, the swirling islands - they took them as if they were theirs. Murdered our Gods, too, fluffy." She spits into the frozen earth as if a bad taste caught in her mouth. From the satchel tied about her neck, a card emerges. The card pulsates with an ugly, crimson light and it soars through the air to hover by Korri's face. The image scrawled on the surface of the card is a tower, aflame and crumbling, with the runes of "XVI" upon the top. The card floats harmlessly for a moment before the image starts to change. Shadows of equines with horns and wings can be seen. The first appears to flicker with sparks and darkness, black and white, but little else can be made of his figure. The falls can be seen as they bend and tear unnaturally through time and space, and within the crimson waters floats the dismembered head of a massive bear. From below, a hiss escapes the maw of Miin. Similar atrocities can be seen with the lands described, with a black dog mangled amongst bamboo under the light of the moon. A gleaming shadow of light and fire dismembers an alligator in a pool of rainbows, and lastly a massive shadow stands over a tiger broken and bloodied on the rocks below a cliff. The card then flickers back to show the tower image, falling in tight curves toward the leather bag at Miin's shoulder. "Kaos made them pay for it, though, fluffy," she coos up at him, delight painting across her face. "Kaos killed those no good thieves and destroyed that land of traitorous filth." Laughter erupts from each of her maws with surprising force and volume, only to stop suddenly. "They were called Helovians, fluffy. Now they are trapped here in the very world they tried to murder and destroy." She looks at him with narrowed eyes, turning her body toward him, inching closer with frail steps. Her neck curves and turns about like a snake, reaching for her prey. "Are you one of them, fluffy?" Korri listened with keen interest as the strange creature spoke. How strange to think he might just stumble upon her, a native, a witness! She might be lying or mad, but enough of her story matched Aedion's. Murdered our gods. Still difficult to believe. What a sight it must have been.... a battle to rival all battles. Were these the Rift's gods? The wolf lingered in Korri's memory, perfectly black. He felt — something. A shudder as if of anticipation rushed through him. The card returned to its owner, and Korri stood with a grunt. He shook himself off, mud clinging to his haunches, but he didn't much care about that, right now. He was intrigued. So close to the truth. She was speaking again, so Korri moved forward to peer down at her. He began to feel rude for keeping such a large distance between them. Strange though she may be, she had attempted no harm... He might fly down lower. They might converse more normally. Korri turned this over in his head until she spoke a word he recognized. Finally, at last, it was his turn to answer back. "No," he responded simply. "But I'm looking for them." Spreading his wings, he leaned further over the edge. "My name is Korri. I'm — I have an interest in the history of this place. May I come down and speak with you further? I want to know what happened to these Helovians. If some of them are still here, why were they allowed to live? After all they did?" Korri skitters like a frightened rabbit atop the cliff, but Miin is preoccupied in her rage and distaste, filling the imagery on the card with all sorts of violent emotion. The boy peers over the edge, his face small, delicate, soft. The crazed maiden's eyes twist and twirl, skimming his flesh from a decent space, her maws opening to breathe in the air wafting down. Feminine, like a rose protected by thorns, that is what she senses. Her eyes narrow again, looking at the soft boy and then she cackles. "Ah, I see, I see," she says quite flatly, surprising for one normally so emotive. No, but I'm looking for them. Another hiss comes from the direction of the odd unicorn, displeased with his quarry. "Seek not those rotten thieves, fluffy," her voice is sharp and dark, like a knife pressed against your ear drums. "They are not to be trusted, definitely not." The rest of his words become like a giant blur, brief impressions of whatever he was originally saying. Korri. History of this place. Why are they allowed to be here? Miin begins to hum, her brain a flurry of activity with no outlet, and she turns her face toward the golden boy on the ledge. For several seconds, she is completely still. Her face slackens, eyelids drooping around those endless pools of black. A sudden snap of activity tugs her lips to malevolent grins. "Sure, fluffy, come stand by Miin," she coos, turning to look back at the falls as one of her maws screeches with intense volume. "Miin will take care of the little orphan boy." A giggle, childish and almost sweet, escapes the other pair of mouths. Backtracking, the elder mare begins to sway back and forth on her matchstick limbs. Like a skyscraper built on flexible joints, waving ceaselessly in the wind. "Their home was ripped apart, fluffy," she begins, thinking how best to describe the utter nothingness that was formerly known as Helovia. Her voice is surprisingly calm and quiet, though a sadistic purr underlies the otherwise placid words. "So they were pulled into the Portal - just like you, fluffy, just like you." "Have you ever wondered, fluffy, what comes after death? Miin can tell you - she has been dead many times. After death there is a big expanse of nothing but serenity; time expands and dilates, swirls and jerks about you. You feel no pain. You feel no sorrow. You do not know loss. You just are. For how long? You cannot tell. "Waking up is the painful part, fluffy. Breathing air so sharp and cold into your lungs. Feeling those old emotions, so powerful yet too distant to resolve. Being dead is easy, fluffy. It is living that is hard." Gleefully, she smiles, looking back toward Korri with all the intensity of a freight train hitting a wall at full speed. "And that's why they are alive, fluffy," laughter chokes her throat for a moment, her heart filling with sick delight. Hacking, the crone finally settles enough to finish speaking. "They are alive so they can feel every loss and every emotion. They can see the familiar lands stolen by greed and stupidity, and remember all those distant things with painful clarity." "May they never know the bliss that is death, for she is too lovely for them." It was probably a bad idea. Everything about her screamed bad, but Korri had lived a lifetime of ignoring his self-preservation instincts. More than that: he was curious about the mare. About her circumstances, her lifestyle. He wanted to see that strange, awful face up close. And he wanted to know... how much she knew about him. Orphan boy — he had not been for a long time. Something about his answer enraged her. Korri felt it from his perch: the gnashing, thrashing, wild emotion she vented through one of her three strange mouths. 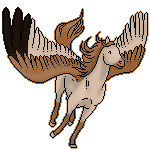 He hesitated, head tilted, before he spread his wings and leapt in a deft motion, spiraling once or twice before he came to land a few paces away from Miin. There, he folded his wings in a (perhaps foolish) gesture of goodwill. "You have died?" Korri asked, leaving off all formalities. His eyes skated over her eyes, her mouths, down the long, long lengths of her legs. She was even stranger up close. A thrill crackled through his nerves, that instinct still kicking strong. That was a fitting punishment, wasn't it? Korri hated the taste of doubt. But it was there, in the back of his mouth. Miin ignores this inquiry entirely, too wrapped up in her diatribe about lady death. The soft steps bringing the plush body closer and closer, her maws snapping with each word. Closer and closer toward the aged, broken maiden. His wings fold and so he is trapped on the ground with her, at least for a few seconds. Goodwill given toward a mad woman known to be a predator. Though, for the most part, she may be harmless. A soft purr is released from her lips as Korri explains his reasoning for finding the Helovians. Her eyes, heavy lidded, turn to look at his delicate features. Intoxicated with malevolent glee, the elder mare cackles with brilliant delight. "Oh, I see fluffy," her voice is sultry and smooth, starkly contrasted to her former shrill voice. "You want to punish them." A sigh, fragile, so terribly fragile, escapes her lips. "Yes, fluffy," she turns back toward the crimson waters, the glass beads of her mane clinking eerily. "Death is a sweetness, an escape from the horrors and injustices of the living." Her voice breaks down into a series of callous and harsh laughs, before her faces take on a darker shade of ill intent. "Besides, fluffy, once you kill something, you can't really play cat and mouse anymore," she says, watching the brilliant crimson waters with all the intensity of a hurricane crashing against the beach. "Cat and dead mouse just isn't as fun." "You want to punish them." Something cold ran down his spine at that. Unrelated to the ruby waters, the chill was more like a premonition. Or like recognition — a thrill and a shudder all at once. Yes, Korri thought, but he held his small body still. He did not trust her enough to relax, though she did nothing more than stare at him with too her many eyes. Stare at him, and speak. A strange thought: is this what it looks like from outside? But he had no desire to harbor such a thought, so he shook it off and listened to Miin instead. They made a strange pair, certainly: the boy hewn in soft light and kind angles, the mare all sharp and pale and crystalline. The more he listened to her, though, the more he suspected they shared more in common than they appeared to. He wondered how terrible this was, if it were true. How possible that he might end up a thing like her, entirely mad and enchanted by even the thought of violence. Korri sighed. He ought to be afraid, he thought, but he felt tired. Doubt wormed its way into him and he resented it, but he didn't blame Miin. He stepped toward her a pace and a half, and paused, regarding both her and the toss of the current with solemn eyes. "You enjoy the hunt?" Korri echoed, and rolled this over in his mind. Memories replayed briefly: so many memories, winged figures and white-rimmed eyes and hulking pale shapes filling dim hallways. Korri shook his head. "I don't," he said, frowning. He was not entirely sure it was true. "I only want to do the right thing," he added, not speaking to Miin at all anymore but rather to himself. With a little shake, Korri spread his wings. His weight rocked instinctively back as his body prepared once more to hurl itself into the air. "You've given me a lot to think about," he added, hesitating. His gaze turned to Miin once more. "Thank you. I hope the following days find you well." And then he was prepared to leave, flinging himself skyward as he did so often and finding, for a time, somewhere he could be alone. Maybe just the empty embrace of the peaks above.